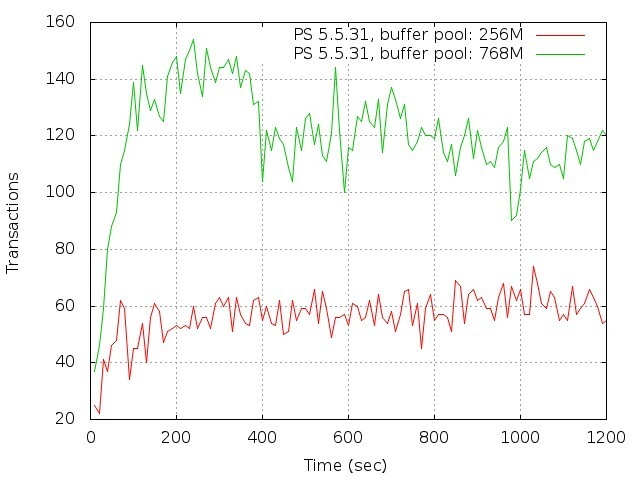 Lots of times we could see different benchmarks performed by tpcc-mysql. So today I want to tell you about how to use tpcc-mysql and how to build graphs with gnuplot in a few easy steps. mysql -u root -p -e "CREATE DATABASE tpcc1000;"
There are 2 files: tpcc-output-ps-55-bpool-256.log and tpcc-output-ps-55-bpool-768.log which have benchmarking results for both tests. Michael joined Percona in October 2007. He serves in several roles, including Persona's 24x7 support coverage. He has an undergraduate degree in computer science, and in 2010 he started pursuing studies to earn an MBA. Great article Michael. Thank you for sharing. There is a little problem in analyze file. In case of awk with field separator (FS) $1 means a first field of input record so this is exactly what I was looking for and it works just like needed. Is that not a true? Will tpcc-mysql be available in your Yum Repository sometime soon? Stefan, I’m not sure about these kind of plans, but I’ll check that with our team. Anyone know what the problem is here please? Is it possible to close the foreign key checking? I want to use this tool to test my sharding cluster, which does not support foreign key. The tool does not perform any actual checking, you can use it as is. Can somebody explain the output?